Oil on board, 5 1/2" x 9"
This mare befriended me across a fence recently, but lost interest pretty fast once she realized I didn't have any treats. Our daughter and her family are coming for a visit, so it will probably be a few days before another post. Have a wonderful Labor Day weekend. Love this one. The composition is perfect. I love all the colors you snuck into the light gray fur! Thanks, Ruth. 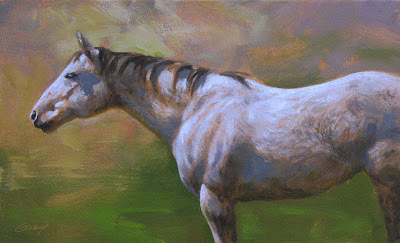 Your horse paintings are inspirational. Wow, Don, that's a big, impactful, beautiful painting on a little bit of a panel. Gorgeous. beautiful, just beautiful. I agree with Belinda, your composition hints to a much larger canvas, well done Don. Thanks a lot, Marilyn--I always appreciate hearing from you. Great work! So glad to have found you! Thanks, Lori and welcome to my blog.